In addition to the pending nationwide Hearing Protection Act, several state bills are on deck to allow suppressor use for hunting in New Hampshire and suppressor ownership in Iowa. Members of the Congressional Sportsman’s Foundation involved in the Sportsman’s Caucus attended silencer demo shoots this month to learn more about how these highly-regulated (for some reason) devices can help protect shooters and those around them. On March 7, members of the New Hampshire Legislative Sportsmen’s Caucus attended a suppressor demonstration at Sig Sauer Academy in Epping, New Hampshire. The event offered an opportunity to educate members of the Caucus on firearm suppressors. The educational demonstration came just two days prior to a hearing on HB 500 (a bill allowing suppressors for hunting purposes) in the Senate Energy and Natural Resources Committee, where it was reported out by a unanimous 4-0 vote. On March 17, HB 500 cleared the Senate, by a unanimous 23-0 vote, and now heads back to the House for concurrence. Following the suppressor demonstration, attendees traveled to Newington, New Hampshire and toured Sig Sauer’s manufacturing facility where they were provided with a deeper understanding of the significant and positive economic impact the company has on New Hampshire’s economy. The American Suppressor Association and Sig Sauer supported the New Hampshire Legislative Sportsmen’s Caucus and assisted the Congressional Sportsmen’s Foundation in organizing and hosting the educational shoot and tour for Caucus members. Meanwhile, the Iowa Legislature recently passed HF 2279 – a bill legalizing the ownership of firearm suppressors in the Hawkeye State. The bill will now be sent to the Governor’s desk for final approval. HF 2279, formally known as HB 2043, passed through the House on February 23 (with a vote of 74-24) and the Senate on March 17 (with a vote of 46-4) with strong bipartisan support. The House then concurred with Senate amendments and passed the bill out of the legislature with a bipartisan vote of 78-21. If signed by Governors Sportsmen’s Caucus member Governor Terry Branstad, Iowa would become the 42nd state in the nation to allow suppressor ownership. Often misrepresented in the media, firearm suppressors are an innovative technology that protects the hearing of recreational shooters, hunters and their dogs, reduces noise pollution, and increases accuracy. 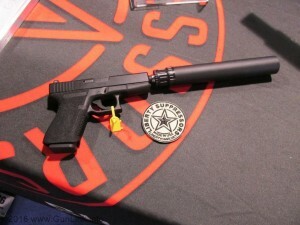 For information about how you can get on board with your own silencer ownership, read this how-to overview.